Woodland edges, dense thickets, overgrown pastures. Rarely near human habitation but sometimes seen on the ground near bird feeders. This is a medium sized, 11½″ long, slender bird with a wingspan of 13″. It weighs about 2.4 ounces. Males and females share the same size and appearance. 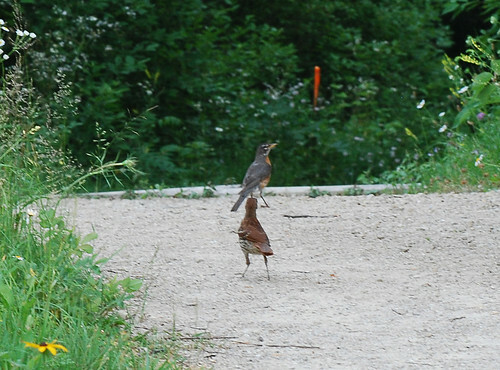 The upper parts are bright reddish-brown (rufous). The chest and belly are whitish and heavily streaked with distinctive, tear-drop shaped spots. 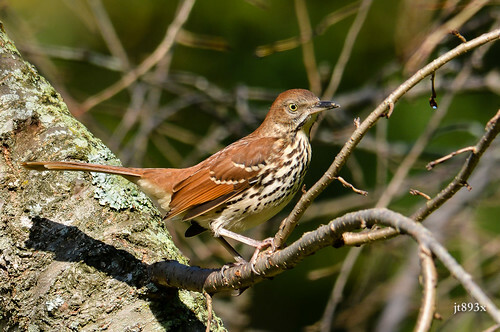 The elongated spots give the underparts an appearance usually described as “streaked”, as opposed to the “spotted” underparts of the Wood Thrush. The tail is rufous, rounded at the tip, and has pale corners. The eyes are bright orangish-yellow. The bill is long, brown, and downward-curved. The song is long and complex and defies description. It consists of a series of short phrases, each repeated once. Wood Thrush (Hylocichla mustelina) wings are entirely brown, not barred. The underparts are spotted, not streaked. The eye is dark with a bold white ring. Insects and other arthropods, berries, nuts, and seeds. Berries and acorns in the winter. The male and female build a nest together in May or June. The nest is usually low in a tree or in a low shrub, sometimes on the ground. It is constructed of grass, twigs, and leaves, and is lined with fine vegetation. The female lays 3 to 5 eggs. The eggs hatch in 11 to 14 days. The young begin to leave the nest 9 to 13 days after hatching. There are usually two broods, sometimes three, each year. 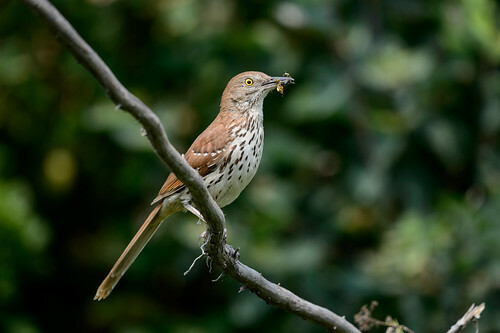 A Brown Thrasher visited the Thrasher's today! Brown Thrasher, Toxostoma rufum, singing. This video features the Brown Thrasher (Toxostoma rufum) singing and taking a dust bath. 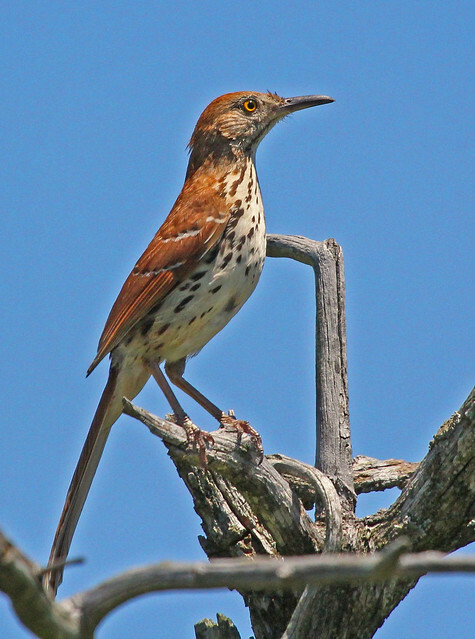 Brown Thrashers are excellent singers and have one of the largest song repertoire of any bird in North America. They also frequently take dust baths which helps to keep their feather clean and dry. I have a pair of Brown Thrashers nesting in the very old honeysuckle right next to my house, near a window, I can see them sitting on the nest! He's been scavenging under our bird feeder for the last couple days. First time we've had one that we've seen in our yard! Beautiful song! It's been hanging out on the top of our tallest trees for 2 days now. This bird had amazing color (like the family Irish Setter) at my feeder this morning. Watched one singing from the treetops in a wooded area for two mornings. Quite the variety of sounds! Had never seen one before, so had to figure out what it was. Never saw one before. It was sitting in my lilac bush and flipping over the wood chips under the bird feeder. We've never seen this species of bird before, but it showed up this weekend in our backyard in the Lexington-Hamline neighborhood of St. Paul. It appears on the ground beneath our bird feeder. This bird has been hanging out all week feeding of my bird feeder. Other birds do not like him. First one I have ever seen in my yard! There is at least one that's been around our yard for the past week. We sighted a pair at our ground feeding tray. Beautiful color. Have never had this type of bird at our feeder before. Did not know they wintered here. He comes to my suet feeder everyday. Love watching him. just refilled bird feeder and attracted blue jays and a burd of similar marking and size. Light brown orange colored. Like a light burnt orange color. Upon research I am fairly positive it was a thrasher. (Of some sort) 2 flew in landed under bird feeder and fed off the ground as blue jays fed above. Looking at the one now. Kinda a orangy cocoa colored Bird. Never seen one before.